Meanwhile, Toronto has the lowest vacancy rate in North America. Office tower vacancies in downtown Calgary were bad before. Now they're worse than anywhere else in Canada. So says a report from commercial real estate firm CBRE, which pegged the overall office vacancy rate at a historic high of 22.2 per cent at the end of the second quarter. That was up from 20.2 per cent in the first quarter, and from 13 per cent at the same time last year. 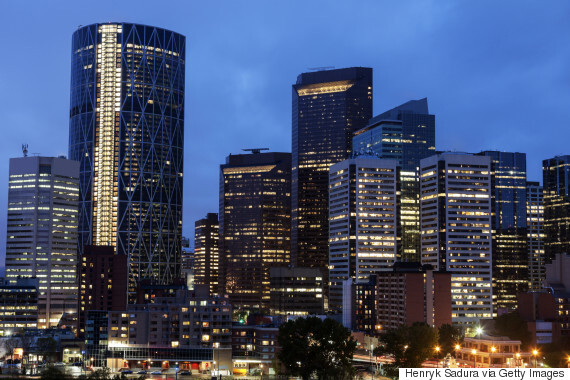 A separate report noted that Calgary's downtown offices experienced 312,148 sq. ft. worth of "negative net absorption" in the second quarter. That means that over 312,000 sq. ft. became available for rent. CBRE said that, for the year to date, downtown Calgary has seen 1,354,858 sq. ft. worth of office space come on the market. And that's a "direct result of downsizing by oil and gas related tenants in Calgary's downtown," it said. The last time there were so many vacant offices in Calgary was in 1983, when it reached 22 per cent during an oil recession. 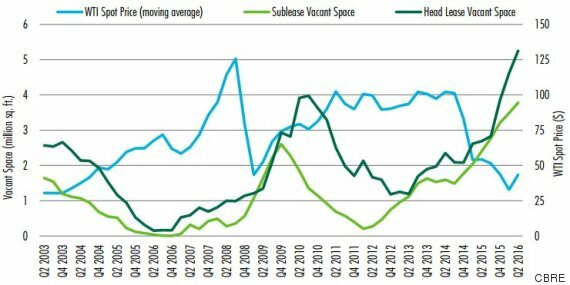 The chart below shows just how much office space became available as the price of oil plummeted over the past two years. And things are only likely to grow worse. 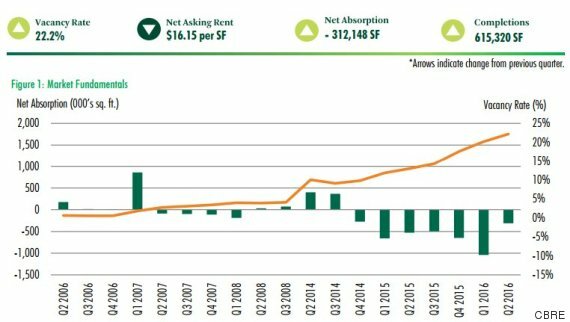 CBRE expects vacancies to go even higher as bankruptcies, mergers and acquisitions take place in the city. And it comes as three major buildings are expected to bring almost 2.4 million sq. ft. on to the commercial real estate market. Over 1 million of that square footage is coming in Brookfield Place, which will be the city's tallest tower upon its expected completion next year. Oil company Cenovus previously committed to leasing 1.4 million sq. ft. in the tower but now it's trying to sublet some of the space, The Financial Post reported. CBRE had much better news for Toronto, whose office vacancy rate is the lowest of any major North American market, it said in a news release. Toronto's office vacancy rate fell from 5.3 to 4.9 per cent in the first and second quarters. That also represented a drop from 5.8 per cent in the second quarter of last year. 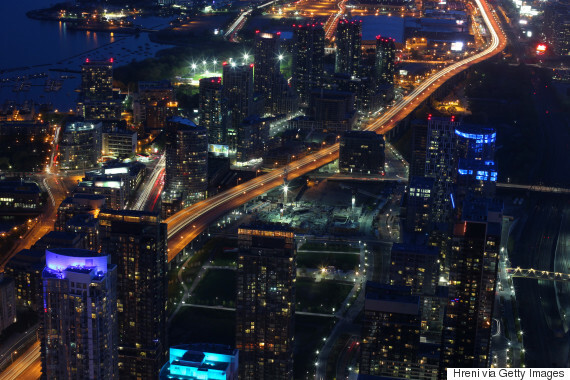 The 6ix is seeing low vacancy rates despite an additional 4 million sq. ft. of supply coming on the market since 2013. It's being filled up due to "robust tenant demand which has allowed for a refresh of the downtown's traditional tenant base," CBRE Limited executive managing director Paul Morassutti said in a statement. The next lowest vacancy rates were found in Vancouver and Winnipeg; each were counted at 9.1 per cent.